Usually, I’m here talking to you about certain types of anxiety and anxiety that happens for a definite reason or has a definite trigger. However, I know and I’ve experienced myself that sometimes, you get anxiety for no reason. And there’s a range of reasons why this could be happening. Anxiety usually doesn’t have just one specific trigger, it’s usually a range of things which can include a trauma from the distant past that’s been brought up again or something that’s happened more recently that’d be pretty obvious, though. And it’s also things like a tired mind and a tired body that unfortunately come together with a really horrible reaction for your body. There are three things that I’d like you to bear in mind when you get anxiety for no reason. Number one, anxiety is a bodily reaction. So, it is mind and body but it’s predominantly body so you get the flight or fight reaction, you get the rapid heart rate, the sweating, the trembling, the scared feeling, that adrenaline surge that goes through your body and then that kicks off the thoughts, the raving thoughts, the worries. Everything that kind of comes together to bring that anxiety reaction. And if there is no imminent threat then the mind will make up a threat because that’s what you need the equilibrium going and I know that’s horrible but that’s just the way your mind and your body works. They will do what they can to support each other and give you a solid consistent story even if that means going through anxiety and going through a frightening time. Sometimes, just being overtired can trigger anxiety. Your body needs a lot of things to keep it functioning happily and normally and sometimes, little things such as a change in diet or a change in sleeping patterns can be enough to really throw your body off its balance and spark that fight or flight reflex that anxiety reaction that triggers all of this. So, some people find that their anxiety is exacerbated by too much dairy, too much caffeine is one that I get from my anxiety. Wheat is another big one, there are people that find that gluten can kick off their anxiety and there’s no other reason for it except they’ve eaten gluten that day. Also, medications. I’ve found previously in the past that there is an antibiotic called Keflex that gives me anxiety as its side effect. There have been times where I’ve had no choice but I’ve had to take Keflex and I just know that I’m going to have anxiety for the week or for however long I have to be on those antibiotics. So, really, it’s one of those things that you just have to counterbalance. You weigh up the positive of the medication against the negative of the side effect of anxiety. Sometimes it’s not anxiety for no reason – it’s anxiety being triggered by something you are not aware of. The third thing, and this is what I say all the time, you’re probably sick of hearing me say this, but when you get anxiety, you just have to drop all resistance to it. You just have to surrender to it, you just have to relax every muscle of your body and commit to riding the wave of anxiety. I call it a wave because it really does behave in the way. It’s like the anxiety comes and it builds and it gets worse and it gets worse and it gets worse and then you think, “This can’t get any worse!” And then it starts to recede and then it calms down and you’re past it, you’re past the worst of it. So that’s the nature of anxiety, it needs resistance in order to fuel it and unfortunately, when you’re faced with anxiety, your reaction is going to be to try to resist it and you just have to go past what that normal human reaction would be and allow the anxiety to be there. When you get anxiety for no reason , don’t engage with it. Don’t fight it, don’t try to move it or manipulate it in any way. You just put space around it in your mind, if that’s what helps you, but allow it to be there. Finally, if you’re experiencing panic attacks or if you feel that your anxiety for no reason, could well up into a panic attack, I have a great free panic self help meditation. What this mediation is designed for is for you to listen to it while you’re actually having the panic attack and it will count you down from 20 down to 1 where the anxiety will slowly calm down and will slowly move past. 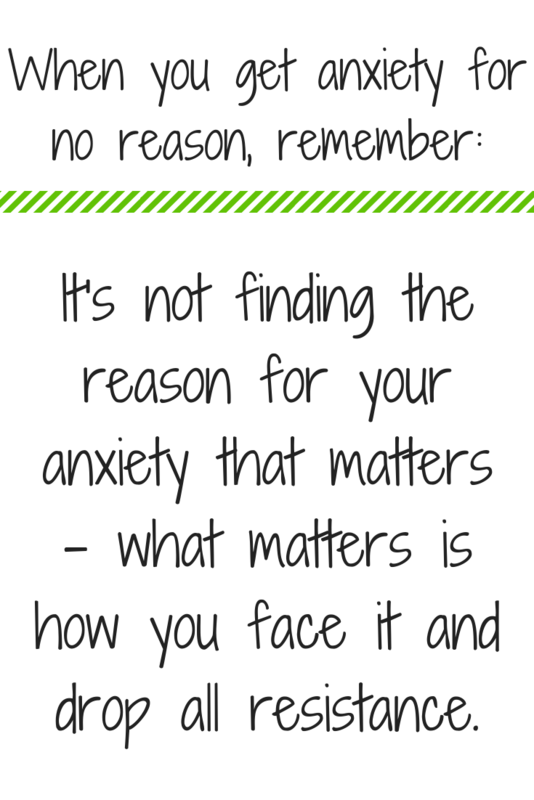 Above all, if you’re getting anxiety for no reason, chances are it’s not for no reason at all. There’ll be one of those underlying factors that’s going to be at play. You don’t really need to try to figure out which one it is, I mean, if it’s a food thing or a medication thing, it’s probably good to avoid them but anxiety can’t hurt you at the end of the day. Dropping the resistance really is the key thing.